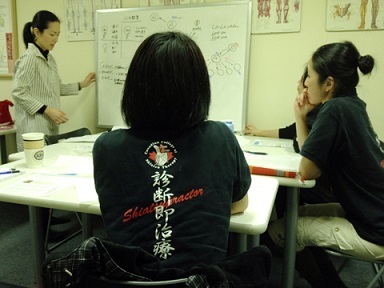 November 27th, 2011, Continuing Professional Education Program, Jikiden-kai was held at Canadian College of Shiatsu Therapy Main Campus. In the workshop, we browsed the literature which Kiyoshi had brought from Japan. One is "Consideration about Shiatsu" written by Rinzo Suzuki Sensei, Shiatsu instructor of Japan Shiatsu College. The other one is the research report about "How Shiatsu in anterior cervical region and lateral crural region influences pupil diameter". 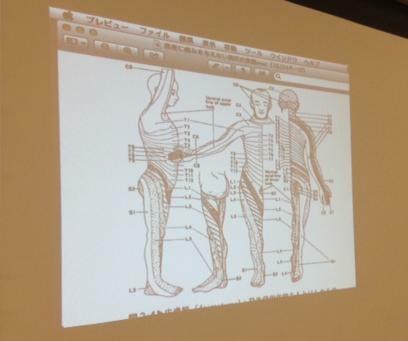 Suzuki Sensei referred three principles of Shiatsu which are 1. vertical pressure, 2. sustained pressure, 3. concentration. He especially explained the importance of vertical pressure. In addition, the importance of "Sasae-atsu" ;Supporting recipient's body by four fingers was suggested. 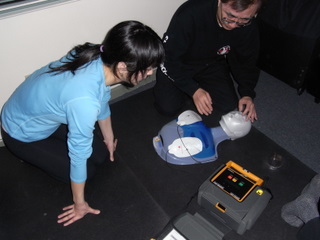 In the discussion, we talked about how to apply pressure without strain as well as how can we make vertical pressure. 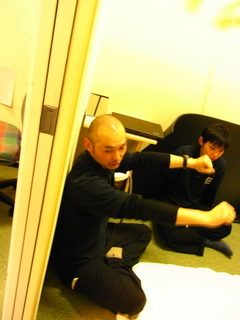 After the discussion, we exchange Shiatsu treatment each other. 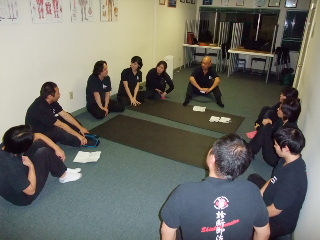 October 23rd, 2011, Continuing Professional Education Program, Jikiden-kai was held at Canadian College of Shiatsu Therapy Main Campus. This time, each member brought concerns which we have in giving Shiatsu treatment to clients to share and solve them. We shared our opinions through not only discussion but also practical. Though we are doing same technique, each therapist has different sensibility and characteristic. It was shown up especially in a discussion of "What to place importance on during treatment". Such as 'To make client's body relax and even sleep', 'To communicate with a client frequently', 'To remove surficial stiffness quickly to approach the cause deeply inside', 'To apply slow and fluent pressure not to make clients tense'. 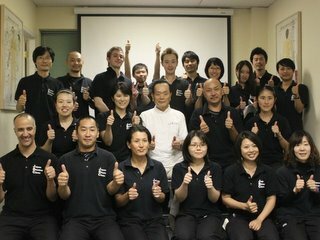 September 25th, 2011, Continuing Professional Education Program, Jikiden-kai was held at Canadian College of Shiatsu Therapy Main Campus. 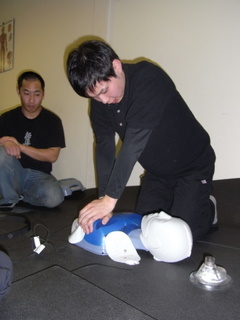 It was our first time that we hire an instructor to the workshop. 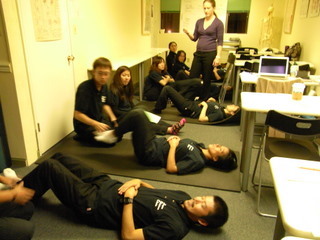 We had invited a Kinesiology instructor whose name is Sarah and she mainly talked about Sports Injuries. It was also our first time to invite a guest who is not a Shiatsu Professional. 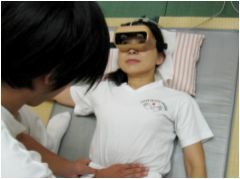 She showed us new perspective of human body and treatment method. 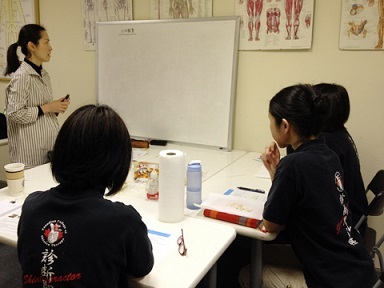 I am sure that her lecture made our treatment various to meet the needs of clients. She explained the causes of major sports injuries such as Tennis elbow, Wrist injury, Ankle sprain, Rotator cuff problems, ACL tears and Back pain. 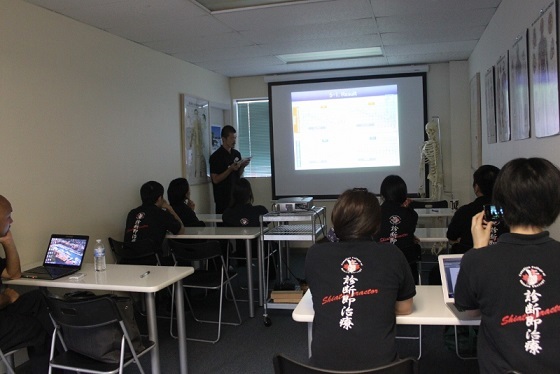 August 30th, 2011, Continuing Professional Education Program, Jikiden-kai was held at Canadian College of Shiatsu Therapy Main Campus. When Koujiro was a student of Japan Shiatsu College, he made a study on scientific evidence of Shiatsu therapy as a member of research group. 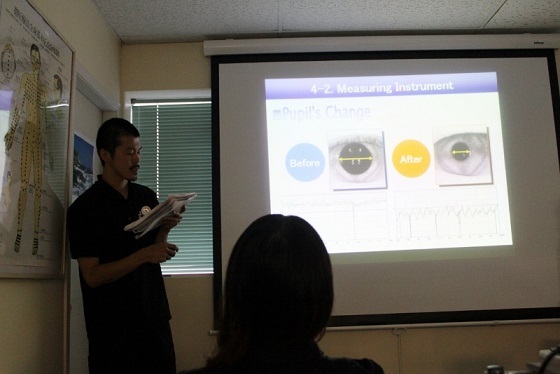 In this workshop, he made a presentation about one of their researches "How the abdominal Shiatsu treatment influences pupil diameter". 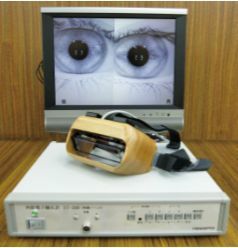 Pupil diameters are controlled by autonomic nerves. Sympathetic nerve activates dilator pupilae muscle which dilates pupils (mydriasis). On the other hand, parasympathetic nerve activates Sphincter pupilae muscle which strangulates pupils (miosis). 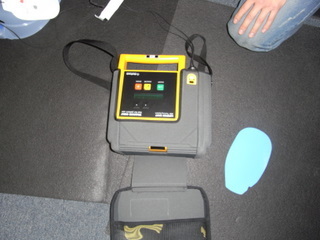 The experiment showed that Abdominal Shiatsu treatment contracts pupill diameter significantly. It suggests that abdominal Shiatsu treatment activates parasympathetic nerve function which helps improve human's natural healing ability. Here is the research of last year! 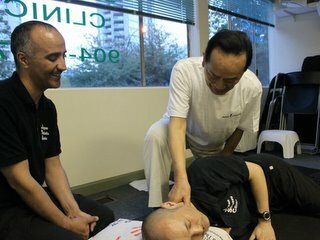 July 23rd, 2011, Continuing Professional Education Program, Jikiden-kai was held at Canadian College of Shiatsu Therapy Main Campus. Kiyoshi's father, Takuo Ikenaga Shiatsu master joined us as a special guest. 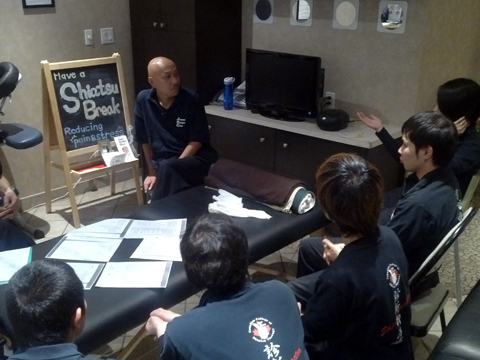 Takuo Sensei has been practicing Shiatsu more than 50 years! He demonstrated case-by-case treatment. We all were riveted by his veteran technique. 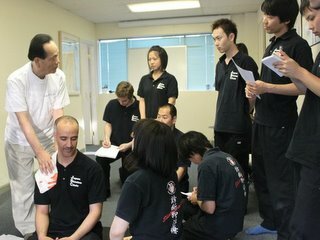 June 26th, 2011, Continuing Professional Education Program, Jikiden-kai was held at Canadian College of Shiatsu Therapy Main Campus. The theme of the workshop was "How to treat lower back pain". Same as the last workshop, we discussed in groups of 5 members about the theme. After that, we made a presentation from each group to share the ideas and techniques. 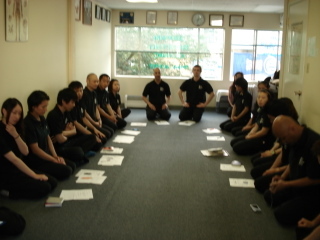 May 21st, 2011, Continuing Professional Education Program, Jikiden-kai was held at Canadian College of Shiatsu Therapy Main Campus. We invited Toshihiro Miyawaki Sensei as a special guest speaker and it became a great success. Toshinori Miyawaki Sensei graduated from Japan Shiatsu College in Tokyo in 1981, which means his career as a Shiatsu Professiona spans 30 years. Recently, he was acting for Shiatsu growth in Argentina for more than 2years. He was also teaching and giving Shiatsu treatment at Shiatsu Argentina. 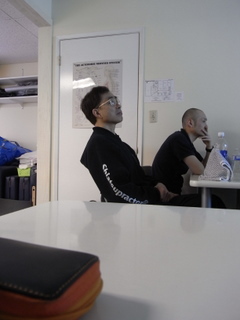 On the way back to Japan, much to our delight, he had been staying in Vancouver. 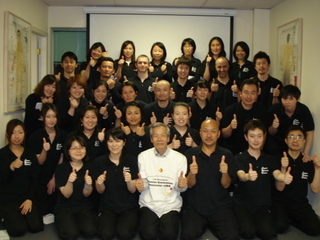 He attended not only the workshop as well as Shiatsu charity held on the 20th. Though he had been treating people for 5 hours without a break at the charity, he energetically gave us a lecture in a genial manner. 30 members attended this workshop. 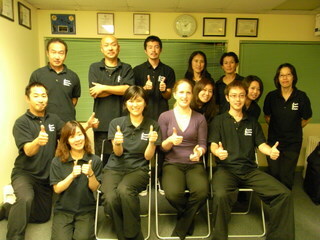 It was almost all the people of JSC Shiatsu Professional! Q. How much is Shiatsu known in Argentina? A. Shiatsu is widely spread in Argentina, but most of them are Zen Shiatsu. There is only one school which teaches original Shiatsu, and I was working there. Q. What’s the percentage of Japanese descended students and clients? A. Just a few. 98 percent of the students and clients are local. Q. What are the chief complains of the clients? Q. How many Shiatsu therapists are there in Argentina? A. I’m not sure. However, the college was established more than 10 years ago. I guess not a few. Q. What is the most difficult thing when you are teaching Shiatsu? A. Teaching in Spanish! Argentines think logically. I had to teach verbally and logically. Shiatsu exchange is the shortest way to improve Shiatsu skill. Receive Shiatsu not only from experienced therapists but also from beginners. Compare the difference between them and reflect it in your own treatment. You are lucky if you have fellows who give you candid feedback. When our skills improve, Shiatsu itself receives increased recognition. 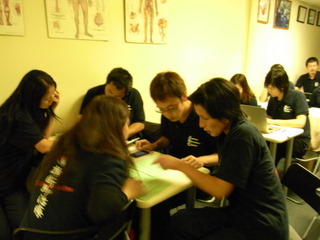 April 17th, 2011, Continuing Professional Eduation Program, Jikiden-kai was held at Yaletown Clinic. No specific theme was set, so we gave and received 60min. Shiatsu treatment each other arranged for one's condition. We learned a lot from receiving Shiatsu as well as being healed. Hiroaki has just joined I.S.I.! 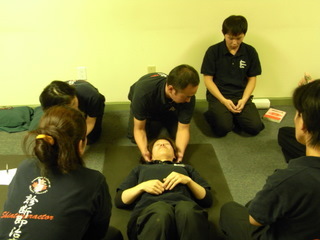 March 27th, 2011, Continuing Professional Eduation Program, Jikiden-kai was held at Canadian College of Shiatsu Therapy Main Campus. 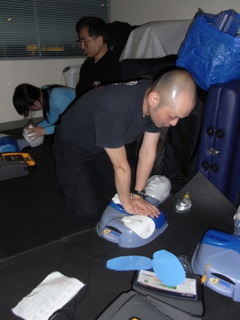 In March workshop, we learned CPR (Cardiopulmonary resuscitation) by the instructor from Red Cross. The 2-hour lecture flew by because it was so great and realistic. 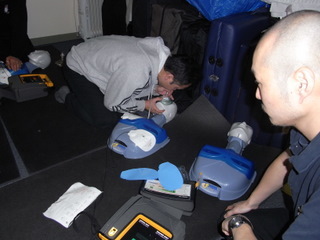 The knowledge about CPR is necessary for all the healthcare workers. As I.S.I. benefits, I hope that Continuing Professional Education will be the place where our members can learn a lot of things not only Shiatsu technique. 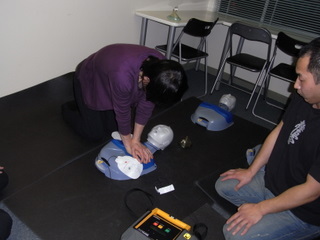 February 28th, 2011, Continuing Professional Eduation Program, Jikiden-kai was held at Yaletown Clinic. 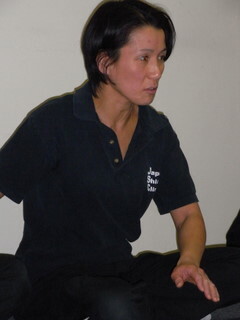 The theme of the workshop was "How to protect yourself when you perform Shiatsu". Smooth pressure is created by your comfortable and proper posture. You need to acquire how to protect your body from performing Shiatsu. When you are in good condition, you can offer good treatments. 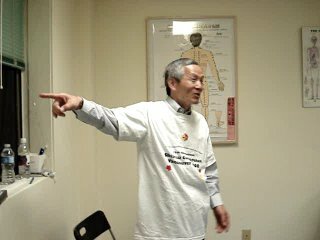 At first, we watched Rinzo Suzuki's instruction (One of the main instructors of Japan Shiatsu College) through DVD, which taught us how to build up our hands and lower limbs as well as the posture when we apply pressure. 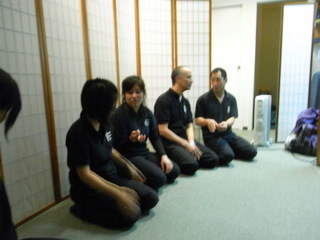 After that, we took a video of each member's posture of performing Shiatsu. And we discussed how to improve our posture referring the DVD. Each therapist has a different body and Shiatsu style. I hope each member can find out their own way which is best suited to them. 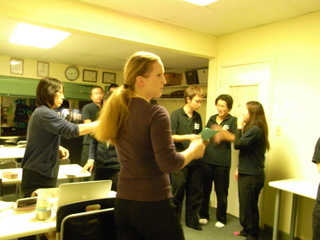 January 23rd, 2011, Continuing Professional Eduation Program, Jikiden-kai was held at Yaletown Clinic. The theme of the workshop was "Stretches". Combining Shiatsu and Stretching makes the treatment effective and long lasting. We shared how to include stretches during sessions and how to advice the clients to stretch by themselves at home. I will introduce some of the stretches we shared! They are Here ! 1. Ask the client if he/she has any limitations on the joints. 2. Observe the client’s face, breathing and stiffened muscles when you are giving stretches and adjust the strength and angle of the stretch. 3. When you are not sure if you can give a stretch of the right strength, just ask client how they are feeling. 1. Tell them to have a stretch when their bodies are warm enough, for example, after taking shower. 2. Advise simple stretches. The clients won't be able to replicate complicated ones by themselves.